I am now up to Week 10 of my challenge. It is a way of keeping myself accountable and getting some extra things done over and above going to work and managing to do the routine housework. You can check out more details here. Each week I add 4 new things to ‘the list’ and try to cross at least something off each week. I must say thank you to The Duke for his part in getting No 33 crossed off the list. I did some of the painting, though. There are not usually any photos with the challenge but I have decided to add some tonight for a bit of interest. Scroll to the end of the list for more details and photos. For those of you who have been following the challenge carefully, you will have noticed that reading and re-homing magazines has been a recurring theme for a few weeks now. All of these various items of reading matter came from my mother’s place when she down-sized to her unit late last year. I took all of these magazines and books because I wanted to read/look at them before probably passing most of them on. I am trying hard to find the time and am gradually reducing the piles. The cabinet came from my parents’ home, also. 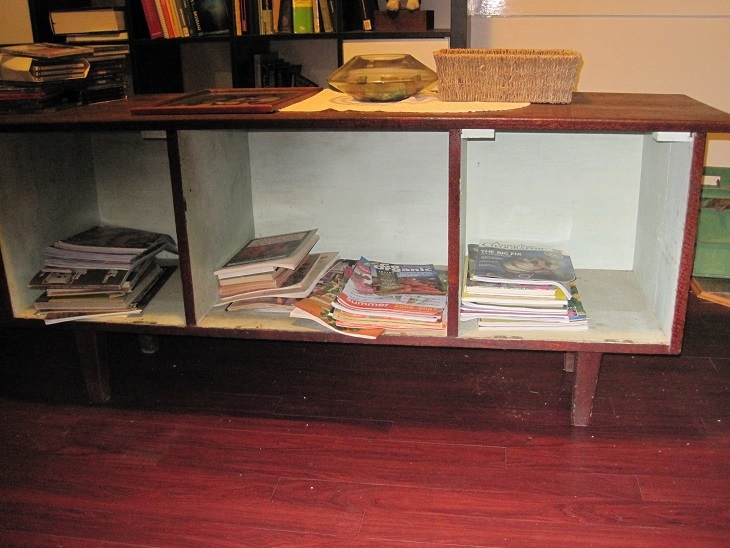 It is currently living in our lounge room until one day I organise to have it re-made into a coffee table. The timber is solid silky oak and it has already been re-fashioned once, over 50 years ago. 37. is a bit of a blast from the past. 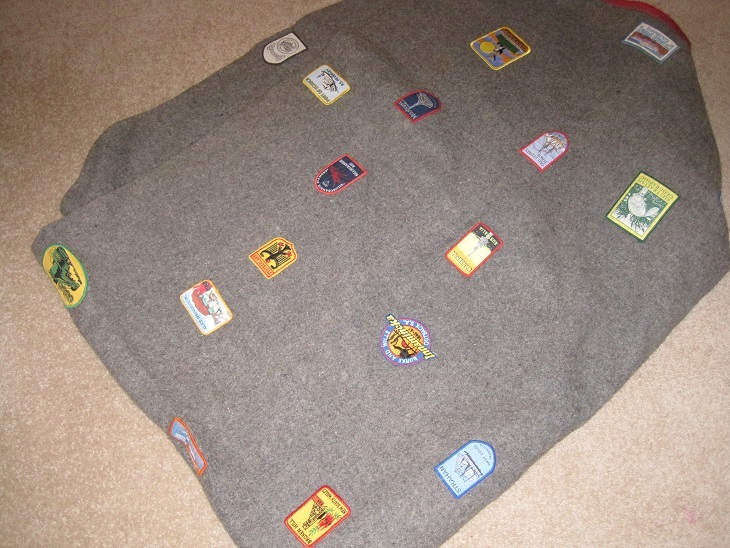 When our daughters were younger we bought them each a grey ‘camp blanket’ and they collected/were given cloth badges of all shapes and styles. I sewed them all on by hand but as years went by I became a bit slack and the badges piled up but were not sewn on the blankets. When sorting out the sewing room I found numerous badges. After discussion with the Belle and Missy it was agreed that the blankets could be passed on to Miss O and Izz. I am going to add all of the ‘orphan’ badges before the girls are old enough to use the blankets. Meanwhile, the blankets will live here as Belle has limited storage. To give you an idea this is one of the blankets with some of the badges already sewn on. You work outside the home & get time to do this stuff? AMAZING! Love the blanket with the travel badges, great momento & yes, a blast from the past! It is a challenge to fit everything I want to do into the day as I (and The Duke) are away from home for 13.5 hours/day. Included in that is about 3 hours of commuting on the train so I use the time to read, surf the net, blog etc. That is why my challenge list is good – it reminds of the things i want to do, otherwise they get lost. Also, most things do not take long to do – it is just about setting my mind to it.